After Minting Coin For North Korea Summit, White House Accused Of Early Celebration : The Two-Way The White House is preparing for a meeting between President Trump and Kim Jong Un on June 12. Despite Pyongyang's threats to back out, the White House has made a coin commemorating the event. Images of President Trump and North Korean leader Kim Jong Un are shown in Seoul earlier this month. The two men are scheduled to meet on June 12, but there are doubts about when or whether a meeting will occur. Weeks before President Trump and Kim Jong Un are scheduled to meet for a daylong summit, there is growing uncertainty over how the meeting will go — or whether it will even take place. The meeting was originally scheduled for June 12, but Trump now says it "may not work out" that day. "If it doesn't happen, maybe it will happen later," he said, after a meeting with South Korean President Moon Jae-in to discuss strategy. The administration is still moving forward with plans for the meeting, Trump says. And the White House Communications Agency has already ordered souvenir travel coins, like it does for many presidential trips. The coins celebrate "peace talks" in 2018 — with no specific date. North Korea has pledged to destroy its underground nuclear test site, inviting journalists to witness the destruction later this week, and satellite images show that work appears to have begun early. But last week, North Korea threatened to "reconsider" the summit if the U.S. continues to push for complete denuclearization. And on Tuesday, Pyongyang issued a fresh series of scathing statements through state media outlets slamming U.S.-South Korean military drills, The Associated Press reports. As a result, even as Trump and Moon talk strategy, Washington is full of whispered worries about whether the summit will even take place or whether Kim would truly be willing to negotiate. "North Korea signaling one thing and then doing another is quite North Korean," NPR's Elise Hu notes. "This White House seems to be a little bit more taken aback [by] it, but this is kind of North Korea's negotiation or pre-negotiation strategy." Meanwhile, people on the Internet are amused — or in some cases, alarmed — by the coins the Trump administration has minted to commemorate the planned summit. But this coin is raising eyebrows. Some people are just taking potshots — at Kim's double chin or the "romantic" pose. 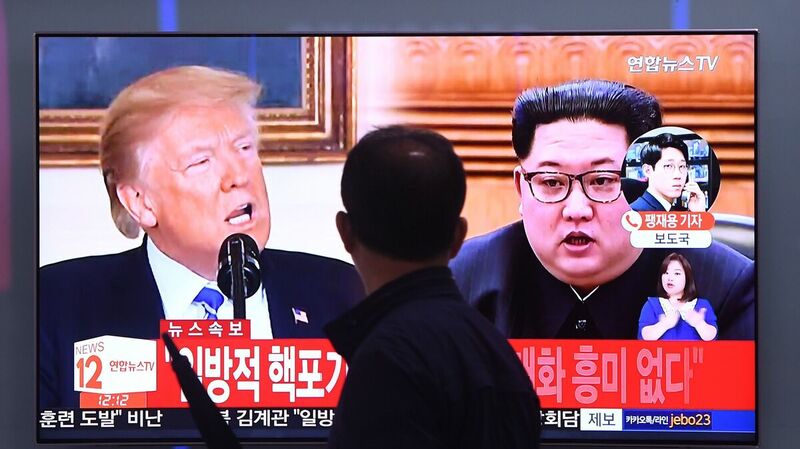 Other critics say it was premature to mint a coin for a summit surrounded by so much uncertainty or are expressing concern that the coin paints Kim in too flattering a light for an autocrat. The coin refers to Kim as "supreme leader." That is one of his titles in North Korea, but it's not one the U.S. typically acknowledges. The White House generally refers to Kim as the "North Korean leader," with no suggestion of supremacy. Senate Minority Leader Chuck Schumer chimed in on Twitter, saying Kim's face "has no place on this coin."